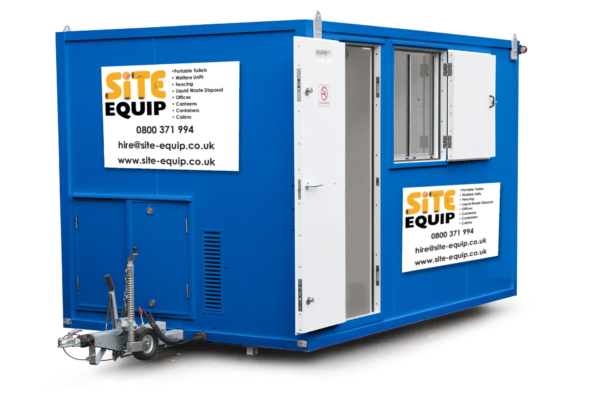 Site Equip have the perfect solution to any temporary site with our anti vandal cabin 12 foot. This unit is great for keeping items secure – at the end of the working shift all the tools and equipment can be securely locked inside the unit. The anti vandal cabin 12 foot comes with lighting and heating, creating a good working environment. Our anti vandal cabins are available in 12 foot and 16 foot. The advantage of wheeled cabin hire is that you can save on transport costs versus the static units which have to be delivered by HIAB transport. Our anti vandal cabins are available to hire for as long as your project dictates, with our friendly sales team on hand if you have any queries during your hire. Why order your cabin hire from Site Equip? Site Equip can deliver cabins across the South East of England, including Hampshire, Surrey, Kent, West Sussex, East Sussex, London, Essex, Buckinghamshire, Oxfordshire and surrounding areas. Site Equip’s cabin hire are all wheeled meaning a reduction in cost compared to static units which require hi-ab vehicles. Site Equip are able to deliver with next day delivery or as and when needed.